Jing Project… the “Scrum” of project communications? One of my favorite ways that I’ve heard the Scrum methodology described is that it is project management designed to compliment how people and human nature actually work, not how we wish they would work. The Jing Project brings that same philosophy to project communications. When you are working with distributed teams, information sharing (the collection of tribal knowledge, if you will) is paramount. Groups that share knowledge effectively and seamlessly flourish. There is a long and infamous list of failed projects that died for no reason other than poor communication. How do managers try to enforce effective and timely information sharing? Usually through a knee jerk reaction of increasingly formalized documentation requirements. The medium of communication is effective, but the barrier to actually communicating is so high that it actually encourages less communication. How do engineers end up sharing information? Telephone calls, IM, and yelling over the cube wall where possible. The barrier to communicating is very low but the medium is absolutely lousy for gaining effective tribal knowledge. Is there a happy medium that is practical and realistic? Enter the Jing Project. The technology is nothing new, but its subtle combination and ease of use hints at a communication method that could change how organizations share technical and procedural knowledge. 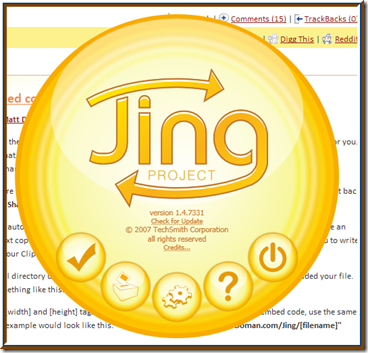 I think it’s only fitting that I let a short screencast explain how Jing works. Of course, Jing is a bit bare bones and is lacking killer features like being able to attach files that live with your videos or link response videos together. But anyway you look at it, the implications for the future are clear.